It's Sunday, and you know what that means... FOOTBALL! As promised, here's a little quick page for you in celebration of the Chicago Bears! 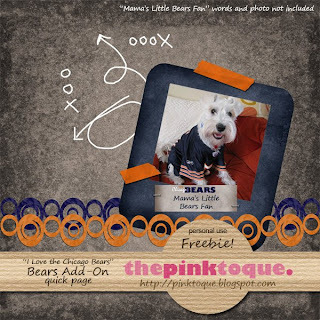 This quick page coordinates with my "I Love the Chicago Bears" freebie kit and the add-on pack freebie given away yesterday. Be sure to snag them if you haven't already! Don't you love the photo I used as my example in the preview? My little Winston, decked out in his Bears jersey. Though I am not sure what's going on in today's game... Tampa Bay is beating us?! Halftime is over so I'm back to the living room to watch the second half... cheer for the Bears, ok? GO BEARS! Download my "I Love the Chicago Bears" Quick Page HERE. Hope you enjoy the freebie as much as I enjoyed making it :) I have a few more quick pages and a couple other freebies ready to give away soon. Look for them this week! Thank you! Your blog post will be advertised on the DigiFree Digital Scrapbooking Freebie search engine today (look for timestamp: 22 Sep [LA 12:00am, NY 02:00am, UK 07:00am, OZ 05:00pm] ).